Last week I took the Organic Sheet Metal class at the new TechShop location in Round Rock, Texas, north of Austin. Our instructor, Matt Quinn of Pipeworx, taught us the basic use of the mallet and sandbag, slapper, T dollies, shrinker, stretcher, english wheel and planishing hammer. We all formed a bowl shape from 22 ga 3003 aluminum. I was pretty happy with what I made. I was really looking forward to learning to use these tools and I enjoyed it so much that I bought a 4x4' sheet of 16 ga (0.063") aluminum the next day and went back to techshop. I cut a 12x12" square and went straight to work on my second bowl. I still have a lot to learn but I really like the art of forming sheetmetal. I plan to make a few more bowls, adding a new challenge/feature to each bowl I make. My next bowl will be deeper and have a horizontal flange on the outside of the rim of the bowl. After that I want to figure out how to make/leave a flat spot in the middle bottom of the bowl so it can sit stable. I've got a few more ideas beyond basic bowls before I move on to a new rear fender for my motorcycle. I took pictures at each step of making bowl #2. After cutting the corners off with the beverly shear. After using both sides of the mallet. I also worked the edge with the shrinker. This is after using the english wheel for the first time. Above you can see I used the shrinker again. This was after more shaping on the english wheel. After using the planishing hammer. Then I went back to the english wheel. I'm losing track here, but I think the above image is after more planishing. This would be after using the english wheel again to soften up the metal. I wanted the bowl to be deeper, so i used the mallet and bag again to start the process over. And here it is after using the shrinker again. This time I made two full rotations on the shrinker. First at the full depth of the jaws, then at half the depth. And actually I think I made a third rotation at 1/4 the depth of the jaws to really flare out the lip of the bowl. This is after more time in the english wheel. Here's where I stopped. I tried to trim the lip and even it out, but there were a few really low spots and I didn't want to go crazy trimming. I want to make the next bowl deeper so I have more room to trim down the lip. This took me about 2.5 hours. 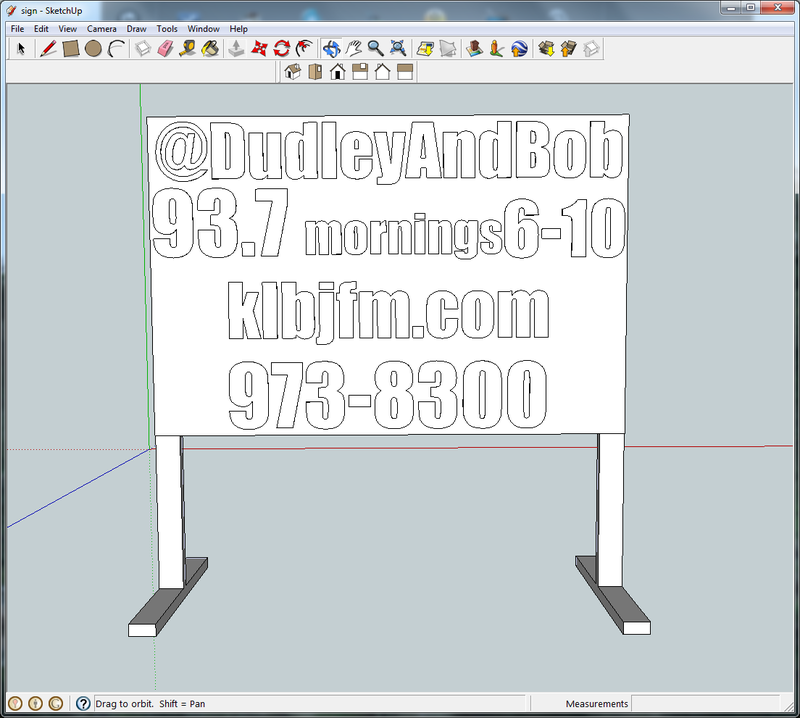 I built a sign to advertise the Dudley and Bob Show on Austin's 93.7 KLBJ FM and mounted it in the bed of my truck. I drove it all over central Texas for more than 800 miles and parked it near major roadways for 31 hours exposing it to approximately 98,937 vehicles. The sign was in my truck for 21 days so it was with me everywhere I went. One of the more creative things I did was to drive the sign to each of the contest sponsors (with a physical address) and take a picture of our signs together. I covered a lot of ground by simply going from sponsor to sponsor. This also tied the sponsors into my advertising campaign. I posted pictures of each sponsor to facebook and twitter in real time during my travels. This was more about logging everything as I did it and less about advertising through social media, although I did get a lot of attention from intrigued friends. I used the Speed Tracker iphone app to track my routes. Screen shots for each day are below. They show distance, travel time, stopped time and total elapsed time. I'm also including a map screen shot of each route. In cases below where I parked the sign, I calculated the traffic per hour using the 24 hour averages. For the moving traffic rates, I averaged all of the counts along the route from beginning to end. I divided that average by 24 hours to get the average per hour for anywhere on the route. Then I multiplied that by Travel Time from the Speed Tracker app. I did not account for every hour parked in a public parking lot. This was quite an adventure and I had a lot of fun promoting the show. 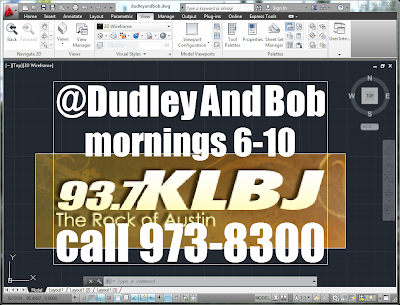 Thank you to Dudley & Bob, KLBJ FM and the contest sponsors for the opportunity to promote a show I love and the possibility to win some money while doing it. 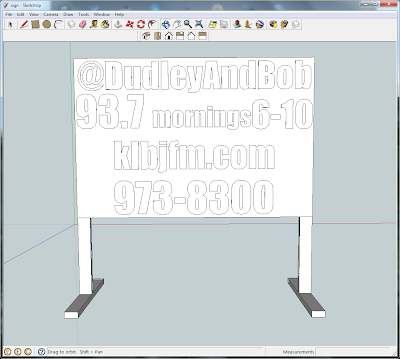 Monday 5/14 - Designed the sign. It's double sided, 4' x 6' and tops out at 9'6" when mounted in the truck. I later found out this was too tall for every drive-thru awning. Oh well, I guess I'll have to park my giant sign in the parking lot while I eat. The lettering ranges from 7.5" - 10" tall. Thursday 5/17 - Finished building the sign and went on a test drive. Later that night, I painted the sign yellow. Friday 5/18 PM through Sunday 5/20 AM - Painted the letters and logo. This was the most difficult part of the entire thing. I wanted it to look good and be readable from long distances. I traced everything onto the sign, but it was very difficult to paint and stay between the lines. I ended up taping all the letter edges on one side of the sign and used my paper templates where I could on the other side to make it easier to paint. According to TXDOT (section 9), this part of highway 95 sees an average of 13,100 people per day. The sign was parked there for 8 hours, so approximately 4366 people drove by the sign that day. Thursday 5/24 - Parked the sign on highway 95 between the hours of 1:00 and 5:00 resulting in exposure to 2183 people. Sunday 5/27 - Amy's Day! I decided to visit as many Amy's Ice Creams locations as I could in one day. I stopped at 7 Amy's locations and had ice cream at the first 6. They gave me a free bottle of water at the 7th location. I also drove by the Amy's on west 6th near lamar 3 times but could not get a good parking space. At each location, I explained to the employees what I was doing and they all replied with encouragement but I also got some weird looks. I tried to get people to look for my sign by offering them free ice cream. https://www.facebook.com/dougpichler/posts/4084082747439 if you click on this photo you'll see the attention it received because Dale accepted the tag of him in it. Tuesday 5/29 - Parked on highway 95 from 1:00 to 6:00. 5 hours on highway 95 = 2729 cars drove by the sign. Wednesday 5/30 - Parked on highway 95 again from 1:00 - 8:00. I worked overtime this day and the sun did not set until 8:25 PM. Another 7 hours on highway 95 = 3820 cars passed the sign. Friday 6/1 - Oak Hill and Beyond. I drove from Bastrop through Oakhill and about half way to Dripping Springs in the evening. I didn't post anything on twitter or facebook this day. 76.7 miles total. The hourly average for this route is 4866 vehicles, multiply by 1hr 41 min and you get 8192 vehicles to which my sign was exposed. Saturday 6/2 - Another day on the road. I thought of visiting competing radio station remotes, so I looked online for upcoming events. All of the clear channel stations listed a kickball tournament at Kreig field, so that was my first destination. Next I drove up and down 6th and 5th streets. After that I headed to the Hancock shopping center on I35 @ 41st. I ate lunch there and drove around the parking lot a few times. 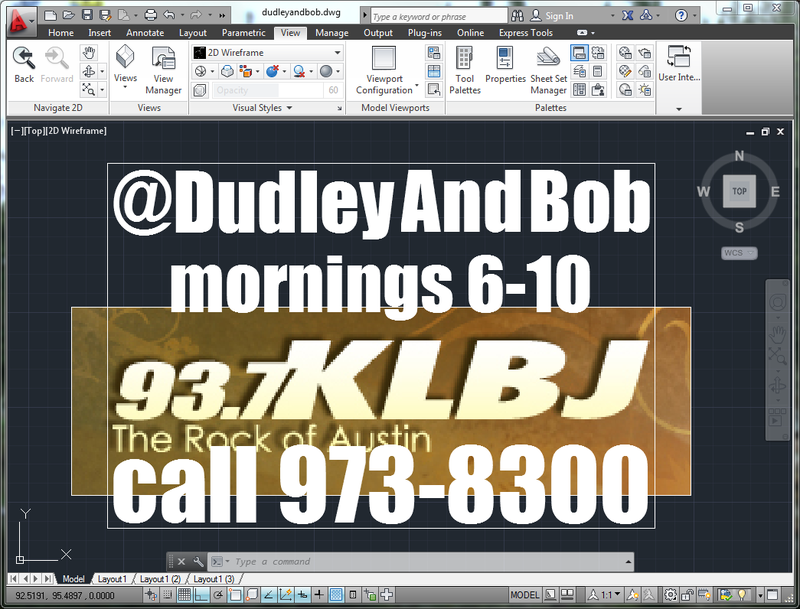 A father and son approached me and asked if I was Dudley or Bob and if the station was putting on a party. Later, one of my friends stopped by for a visit after seeing my facebook post. As I was leaving, I got a few honks and thumbs ups from people. Next I drove by the casting call for the Machete sequel at Austin Studios. The sign got a lot of attention as I pulled in. After that I headed north and drove though the IKEA parking lot on my way to Hardtails. I took a quick photo at Hardtails then headed to a friend's house in round rock for quick visit. Next I got on 183 and drove south to I35. I went north and stopped at Spinners near Wells Branch. After that I went west on Parmer and stopped at Fry's. Then I took Parmer east to 290 before sunset. Tuesday 6/5 - Parked on highway 95 from 1:00 to 6:00. 5 hours on highway 95 = 2729 vehicles passed the sign. Wednesday 6/6 - Briefly Parked on highway 95 from 8:00 - 10:00. One of my coworkers noticed some city workers investigating my truck, so I moved it off the highway. My employer owns the land and I had their permission to park there, but I did not want my truck to be towed. 2 hours = 1091 vehicles. As part of my company's Christmas festivities, we are having a snowman building competition. It rarely snows in central Texas, so the only rule to the contest is that our snowman has to be made of cardboard. Mine is pretty much complete except for the nose and the final wiring. He waves his arm and the corncob pipe houses an LED that fades on and off, simulating a smoldering pipe. Here's a quick preview.